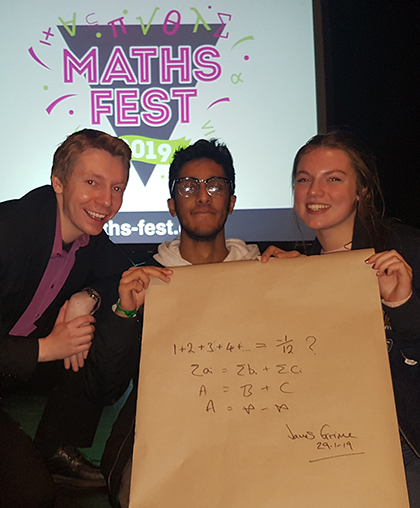 Gifted mathematicians from The Sixth Form College, Solihull attended Maths Fest 2019 this week to hear from a range of Maths experts. Held at the New Alexandra Theatre in Birmingham, the first year A level Mathematics students attended this day-long event to hear from some of the best mathematical speakers from around the world. Maths teacher Matt Parker, who is also a stand-up comedian and founder of MathsJam, was the organiser and compere for the event, introducing the speakers and entertaining the students with his favourite maths puzzles. Among the speakers at Maths Fest 2019 was Rob Eastaway, author of books on everyday maths, including ‘Why Do Buses Come In Threes?’ and ‘The Hidden Maths of Sport’. TV star and University College London lecturer Hannah Fry was also present, as was James Grime, who has toured the world with his code-breaking talk and a genuine WWII Enigma machine! Students also heard from guitar playing applied mathematician David Acheson, who teaches at the University of Oxford. Also from Oxford is Vicky Neale, who is the author of popular maths book ‘Closing the Gap’, all about prime numbers. Completing the line-up was Ben Sparks, who is a mathematician and busker from the University of Bath.